ProKick Kickboxing enthusiasts were tested in the hope of moving up to the next level at the ProKick Gym in Belfast. Sunday afternoon 09th April 2017 was graduation day for some of the ProKick Seniors & Junior (Kids) Members. Our ProKick Kickboxing enthusiasts were tested in the hope of moving up to the next level at the ProKick Gym in Belfast. A few levels from beginner to first senior grade Green belt level spent Sunday afternoon kicking & punching in hopes of moving up a grade. 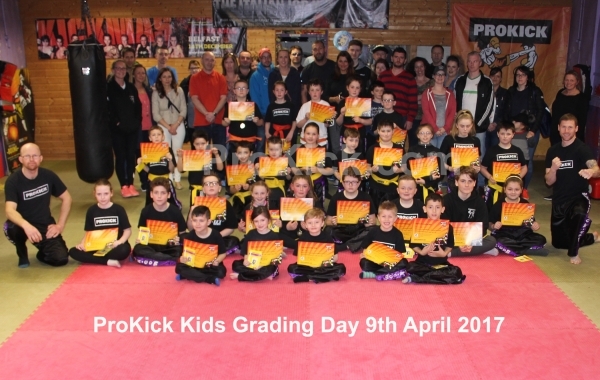 The #ProKick grading saw the younger to the the adults all going through their ProKick exam with a series of tests covering different aspects from the sport which helps elevates students to the next level. What better way to spend Sunday afternoon 09th April 2017 than at the ProKick gym - Adult Kickboxing enthusiasts were tested in the hope of moving to the next level at the ProKick Gym in Belfast. A few levels from beginner to first senior grade Green belt level spent Sunday kicking & punching in hopes of moving up a grade.